A management committee under the chairmanship of the Vice-Chancellor, Professor Jayashankar Telangana State Agricultural University with representatives from DoE, GOI, Line departments of client states, MANAGE, ICAR, Ministry of Rural Development, SAMETIs and farmers from client states as its members meets twice a year to review and fine tune the capacity building activities to help in effective functioning of institute. Director, EEI is the Member Secretary. 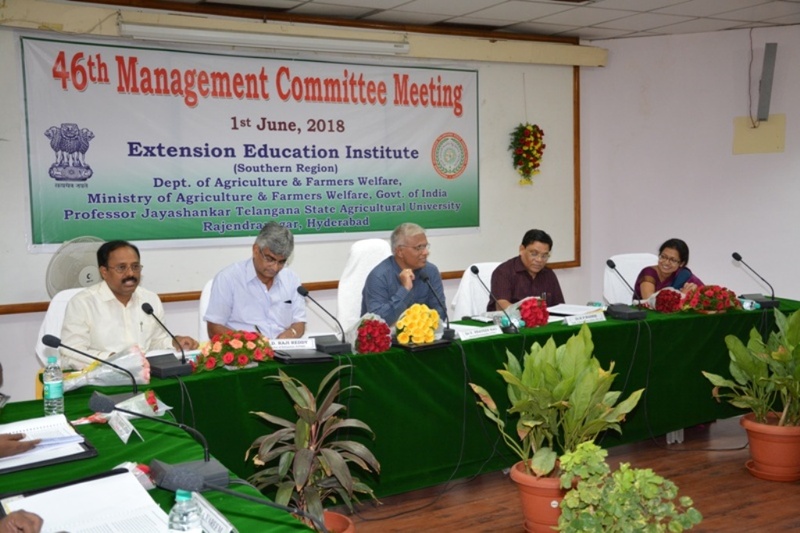 The 46th Management Committee meeting of EEI, Hyderabad, under the chairmanship of the Vice-Chancellor of Professor Jayashankar Telangana State Agricultural University was held on June 1st 2018, at EEI, Hyderabad campus. 21 members including Client State representatives and farmer representatives participated in the meeting to fine tune the administrative and functioning modalities of the Institute. The permanent office bearers/ members of Management Committee included representatives of Directorate of Extension, Government of India, representatives from sister institutes like MANAGE, NAARM, NIRD, TSIPARD and representatives of SAMETIs from all client states. The other members are elected for a period of three years on rotation basis from each of the Client State/ Union territory and respective client departments. The Director, EEI would be the Member Secretary for the committee. The 46th MCM of EEI was attended by Dr. V. Praveen Rao, Hon’ble Vice-chancellor, PJTSAU; Dr. K. P. Wasnik, Additional Commissioner (Extension) DoE, GoI, New Delhi; Dr. D. Raji Reddy, Director of Extension, PJTSAU; Sri. M. B. Ramesh Kumar, Comptroller, PJTSAU; Smt. Pausumi Basu, IAS, Commissioner, TSIPARD, Hyderabad; Dr. K. Madhu Babu, Director, EEI, Hyderabad and other members.